Cheese has been an important part of Bandon’s history since the 19th century. The industry has survived two major fires in 1914 and 1936 that destroyed much of the town’s infrastructure and architecture. The Bandon Cheese Factory on Highway 101 was erected after the last fire and produced a variety of cheeses. Residents and visitors enjoyed tours of the factory and its products for many years. In 2000, the Bandon Cheese company was bought by a larger company, and the factory was closed and then destroyed. Residents mourned its loss, and it looked like Bandon cheese might be gone for good. In 2011, however, the urban renewal agency of Bandon purchased some of the land previously occupied by the old factory, and plans for the return of cheese were put in place. A partnership between the city and private investors formed, and Face Rock Creamery was born. A good cheese company needs a good cheesemaker, and the Creamery found him in Brad Sinko, the son of the former owner of the Bandon Cheese Company. Sinko had been living in Seattle where he helped start a handmade cheese company but was lured home to Bandon to create the quality cheese for which Bandon had always been known. 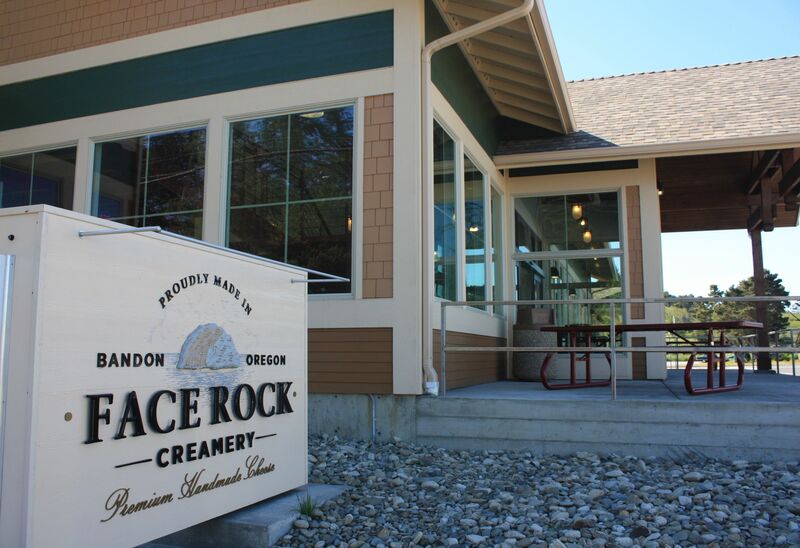 In May, 2013, the Face Rock Creamery opened its doors to a town happy to see that Bandon cheese was back. People are glad, in fact, to the point where the Creamery sometimes has the good problem of having a hard time keeping up with demand for its products. The Creamery is open daily. Through large windows, visitors can witness the cheesemaking process while tasting a variety of samples, and the beer and wine bar staff can suggest cheese pairings. The gift shop offers cheese products, butter, cranberry wine, Umpqua ice cream, glassware, apparel, and kitchen accessories as well as other local products. Climb the stairs and enjoy the view of the Coquille River, the lighthouse and the jetty. The Creamery’s wide variety of cheese products include 10 flavors of cheddar cheese (including “In Your Face” Cheddar and “Vampire Slayer” Garlic Cheddar as well as plain, smoky and more), cheese curds, fromage blanc, and Monterey Jack. They are available at nearly 300 outlets in five states, including retail locations such as Fred Meyer, New Seasons, Market of Choice and Harry and David as well as dozens of independent stores, markets and restaurants. You can also find them at the Eugene Saturday Market and soon at the Coos Bay Farmer’s Market. The Face Rock Creamery celebrated its first anniversary in May, 2014. They invited the community to celebrate with them, offering live music, walk-in specials, food and beverages for purchase, free samples, and, of course, cheese! Many residents and visitors stopped to wish the Creamery a happy birthday and to join in the fun. It has become an annual event that the community looks forward to. Visit the Face Rock Creamery’s website where you can read more of its story, see the products for sale, order your favorites or see where you can buy them directly.